Why a kilo of Vietnamese Lotus tea could cost up hundreds dollar but never found itself out of demand? The reason why will be revealed below and you will soon find yourself craving for a pot of this elegant tea. It’s not came out of the blue that Lotus has become Vietnamese national flower, Lotus represents for beauty, purity and good fortune in consider of Asian ancient concept. Lotus can be found everywhere in this S-shaped nation, but ones in Hanoi West Lake was regarded to be the best which nowhere else could ever compare. 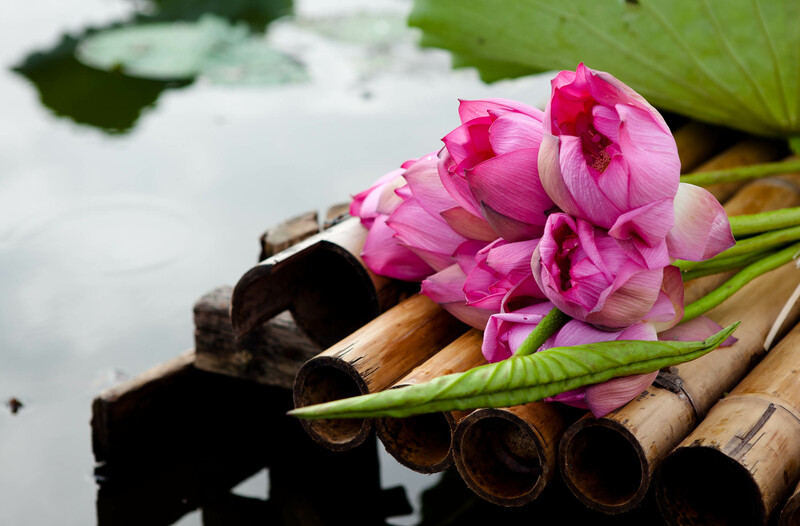 In other places, Lotus has only a few layers of petals with yellowish nectar, unlike its siblings from the West Lake, which was called “Sen Bách Diệp”, means hundred petals Lotus. The scent of West Lake Lotus is also different from other, yet it’s subtle, but linger-able and especially unforgettable. The ancient Hanoian had found the way to bring all the quintessence of this flower into the art of tea, by making fresh, premium green tea naturally embalmed with the fragrance of Lotus. 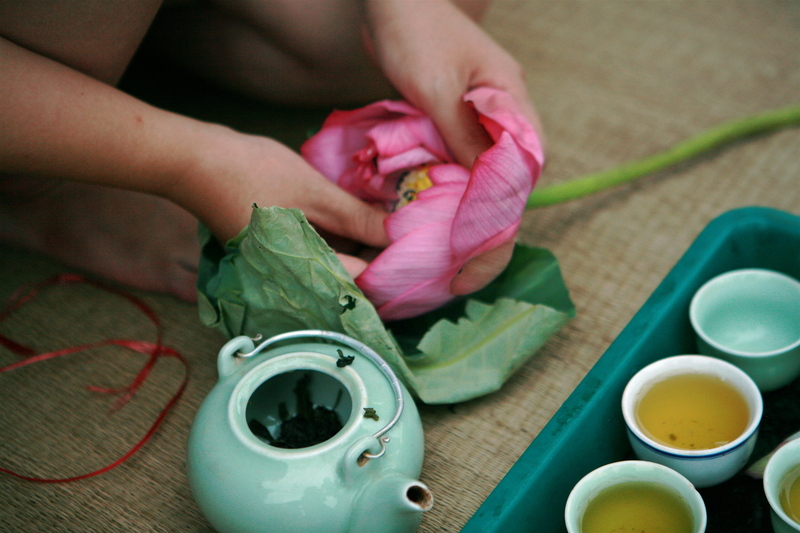 By its careful consideration in each and every step of the dainty, time-consuming process, Lotus tea is considered as an indispensable art form of the Hanoian. Old villages lie around the bank of the West Lake are places where the most skillful tea makers could be found. The people in Quang Ba, Tay Ho and Nghi Tam village are famous for being the best Lotus tea embalmer in Hanoi with inherited family’s secret receipts for hundred years. In the time of monarchy, Lotus tea was served only to high-class nobles or the Royals hence it was considered to be luxury and opulent, therefore only limited amount was produced. Later on, Lotus tea is still regarded as precious tea which is used in special occasion or ceremony only, to express the host’s hospitality. Lotus was originally created in the Nguyen Dynasty during the 19th century, in dedication of King Tu Duc. At night when the nectar was at its fullest, the servants would row out in the lake where the lotus blossoms grew. Very carefully and gently, they would peel back each fragile petal of the blossom and fill it with green tea. Then the flower was closed up, and the petals bound with ribbon or silk string, keeping the tea safe and dry as it absorbed the scent of the lotus overnight, but that not the end, early in the morning, they rowed out again not only to collect the tea but also to gather nighttime dew, just enough for a single tea pots. Using a high-grade green tea base from the highland of Vietnam, the Lotus will scent the tea with its luscious fragrance, produces a lovely, sweet aroma, with hints of vanilla tea. This traditional method of embalming by wrapping tea inside Lotus blossoms is still used yet no longer popular, only 30 families are using this ancient method. Tea makers nowadays prefer to pick the Lotus blossoms right after it started to bloom than fill them up with tea every night. However, the making procedure of Lotus tea is still very complicated and required a lot of meticulous work from the tea makers. 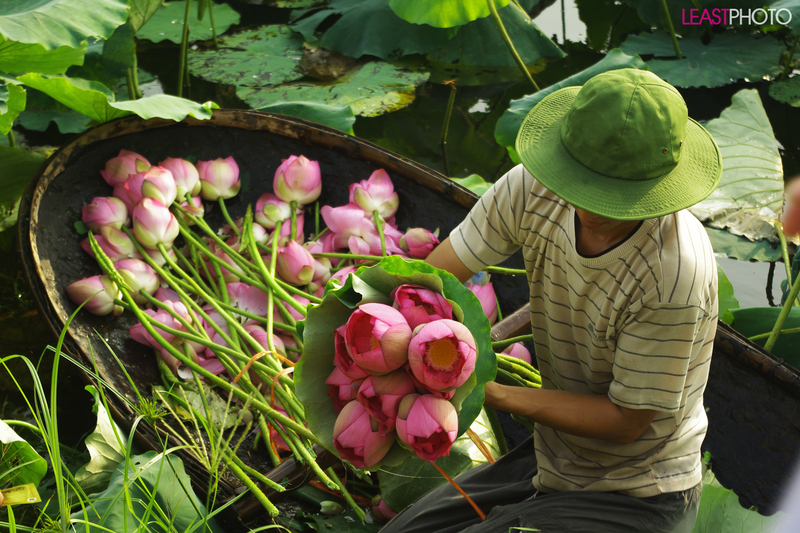 Early in the morning, about 4 – 5am before the sunrise, people have to row out in the West Lake to pick up Lotus blossom, this process has to be done quickly in order to get the scent at its finest of freshness and lusciousness. Expert tea scenters then choose the best Lotus blossoms and disassemble them, using care, they gently and quickly peeled “Lotus rice”, the small organ that fragrant the blossoms known as stamens. With Lotus petal, they use them as initial scenting process, tea will be embalmed with these petals for 2 days then dried up and passed to the next step with Lotus stamens, which is the most important part in scenting Lotus tea. 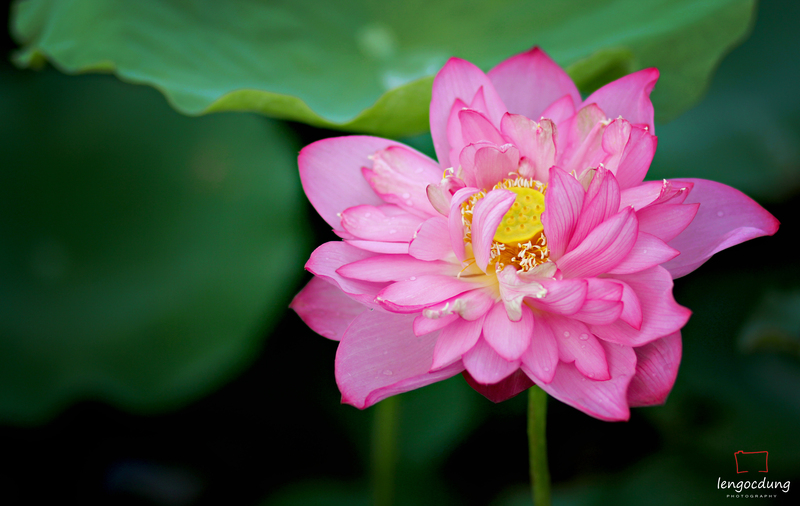 1000 Lotus blossoms deliver only 7 – 8g of stamen, enough talk about how rare and precious this scenting material is. But it doesn’t mean that 1000 Lotus blossoms can provide enough stamens for scenting 1kg of Lotus tea. 2g of stamen is enough for scenting 1kg of tea, but we all have known that the scent of Lotus is just subtle, then this scenting step require to be repeated again and again 7 -8 times to make the tea fully embalmed with the fragrance of Lotus, which mean 1,4 – 1,6kg of Lotus stamen is needed, at least 1400 Lotus blossoms to scent a kilo of tea. Such an enormous number! Producing Lotus tea require meticulous work with great effort, along with skillful skill in embalming by experts tea scenters. Otherwise, scientist have proven that there is a lot of health benefits of Lotus tea, especially is a remedy treating the stomach, spleen and liver. It is also said to treat summer heat syndrome, which is characterized by overheating and sometimes accompanied by a heat rash. Lotus leaf tea is also effective against high blood pressure because of the tea’s alkaloid content, according to the Institute of Traditional Medicine. The tea’s calming properties also alleviate restlessness, heart palpitations and insomnia. There is no surprise that a kilo of this meticulous tea could cost up hundreds dollar per kilo, now you’ve understand why, it worth every penny. 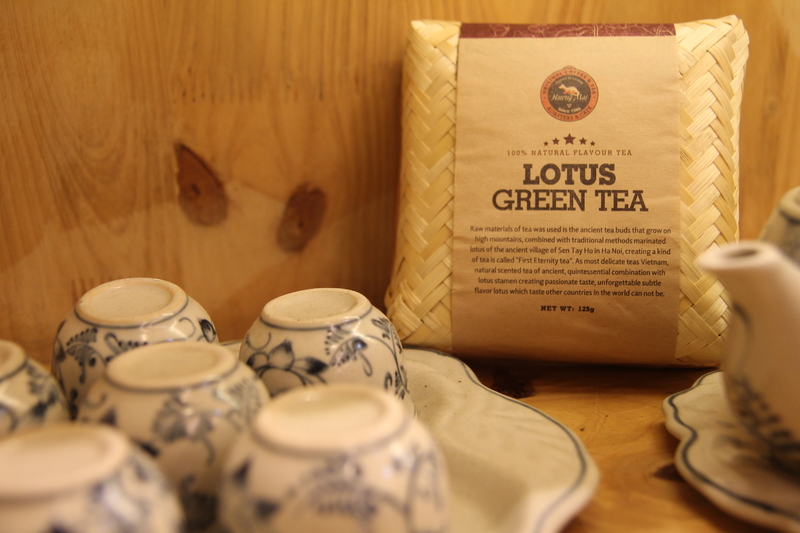 Lotus tea is jade green in color, with tightly twisted leaves and with a pale, amber-colored infusion. It has a crisp, clean flavor, vanilla hinted and the great scent of Lotus blossom lingering in the mouth. If you want to taste this legendary tea, wait no longer because we have already restocked this noble tea in our tea product range. Find out about Lotus tea in our website. Premium green tea manually embalmed with the scent of famous West Lake Lotus blossoms. Have a peaceful day, have a Lotus tea.